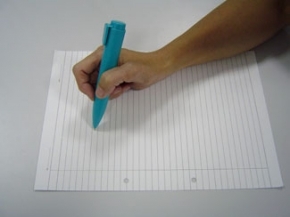 The Lite-Touch pen is ideal for those who suffer with arthritis in the hands. This rheumatic pen has a soft, rounded shape that provides an ergonomic grip, and helps make writing easier. It has a comfortable grip and has a slight indentation in the thumb area that aids gripping, and due to its design requires next to no pressure to write. If you suffer from rheumatic or arthritic conditions and have been looking for pens for rheumatic hands, look no further! Suitable for use by children and adults, the Lite-Touch pen will make difficult and painful writing a thing of the past. Pen is easy to hold and allows you to write without any pressure , I did however think that the price was a little excessive .